There is a corner of the Internet in which characters from Jane Austen’s novels have Facebook profiles, Twitter handles and Pinterest boards. You’ll find Pride and Prejudice’s Elizabeth Bennet (who goes by Lizzie these days) working on her final graduate school dissertation, tweeting at William Darcy about their day spent sightseeing together and posting pictures of a night at the bar with her sisters and friends. You’ll also find Emma Woodhouse, of Austen’s Emma, working as a lifestyle coach and matchmaker and usually posting fashion and romance advice on her Tumblr blog. If you’re a little confused, let me explain. These profiles and blogs that belong to Austen’s fictional characters are maintained by a man named Bernie Su, who, along with his co-producer Hank Green, created a modernized web series adaptation of Pride and Prejudice in 2012 and recently started to do the same with Emma. While this is certainly not the first time Austen’s most popular works have been adapted to fit more modern times, it is the first time an adaptation has taken such an interactive form, allowing audience members to completely immerse themselves in the story and interact with characters. “The Lizzie Bennet Diaries,” Green and Su’s Emmy award-winning adaptation of Pride and Prejudice, premiered on YouTube in April of 2012 and came to a close in March of 2013 after 100 episodes, which accumulated over 40 million views in total. By the time the series ended, Lizzie Bennet’s YouTube channel had over 200,000 subscribers, and that number only continues to grow, even despite the conclusion of the series. The series is expertly written towards a younger, more technologically savvy generation, in more ways than one. There is, of course, the incorporation of modern day technology, but what makes “The Lizzie Bennet Diaries” such a successful and enjoyable adaptation is the seamless way in which characters were integrated into the year 2013. Su and Green clearly took extra care to develop each character’s personality in a way that would accurately fit the 21st century while still retaining the traits and underlying drives and desires as Austen’s original characters. The result is an ensemble of witty, sarcastic and likable characters who seem less like fictional characters, and more like friends you go out with on the weekends or share snarky remarks with in an otherwise boring lecture class. As is often the case when characters seem more like friends than works of fiction, when the series came to an end after almost a year, fans were left with a void. Even though the final episode left me grinning at my computer screen like a ridiculous fangirl, I still found myself feeling let down by the knowledge that it really was the end. That void that fans were feeling, though, was soon filled with the announcement that Su and Green were working on a new adaptation, this time of Austen’s 1815 novel, Emma. 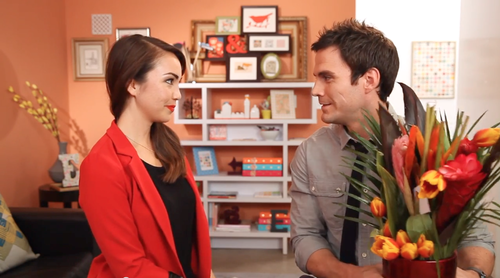 “Emma Approved” premiered on Oct. 7, and viewers were immediately introduced to Emma Woodhouse as well as her lifelong friend and business partner, Alex Knightly, the web series equivalent of Austen’s George Knightly. While only 10 episodes have aired at this point, it is clear that same features that made “The Lizzie Bennet Diaries” such a success have carried over. The characters, at least the ones viewers have been introduced to so far, have been updated in a way that makes their existence in the year 2013 wholly believable. Emma is independent and overachieving, and though she can sometimes be arrogant, her sense of humor and determination make her ultimately endearing. Alex, more cautious and calculated by nature, balances Emma out and is always on the lookout for her well-being, whether Emma realizes it or not. The series is clearly more produced than “The Lizzie Bennet Diaries,” giving it a more professional appearance, unlike the more casual, laid-back vibe that was present in “The Lizzie Bennet Diaries.” While some fans may find this change unsettling and attribute it to the success of Green and Su’s first project, it might also be viewed a stylistic choice that makes sense on a basic characterization level – Emma is much more of a perfectionist than Lizzie, of course her videos will be more professional. “Emma Approved” is still in the beginning stages of plot development, and a majority of the series so far has been devoted to character introduction and basic exposition, but those who have read Austen’s original Emma, realize just how important those items are to the story as a whole, and are sure not to be let down. If Green and Su deliver just as they have in the past, Emma’s story is sure to be told in a believably creative way, proving that even though Austen’s works may be 200 years old, that doesn’t mean her stories have grown stale. In fact, they might be just as relevant and relatable as ever. New episodes of Emma Approved premiere every Monday and Thursday at 12 p.m. on YouTube.